Curious to know which Daily Illuminator was the most popular this past year? Me, too! I wound up diving into the archives and used a secret algorithm (once used by the Bavarian Illuminati to handicap greyhound races) to figure out what was read the most. Our Open (Ogre) Letter to Distributors about Ogre 6th Edition narrowly beat out the Munchkin Axe Cop announcement for first and second place, respectively. We released Munchkin Axe Cop in November, but we postponed Ogre 6th Edition because of a new opportunity for Munchkin. The third most popular Daily Illuminator was about our Discworld promo card for NADWCON 2011. The Luggage: Don't Leave Home WithOUCH! 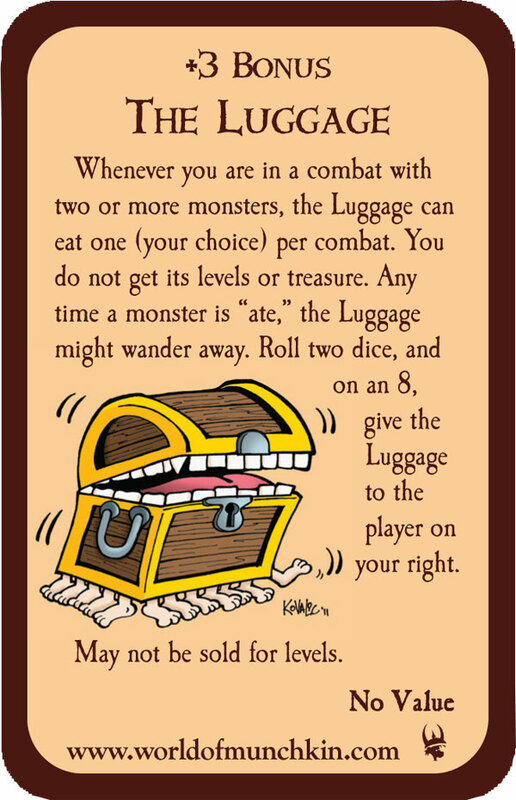 was such a huge hit, we quickly ran out of The Luggage promo cards at Warehouse 23! In fourth place? The Munchkin Webcomic Contest! It turns out there are a lot of webcomic creators out there who love Munchkin, and we were pleased to see all the entries. We hope you enjoy the winners, linked on the contest page! It'll be interesting to see what's popular in 2012. There's a lot in the pipeline and I can't wait to see how you'll react when you hear about fnord!